If you’ve been paying attention, you’ll know that we have a new design for The Next Web currently in beta testing. It’s more than just a reskin though, this is a radical rethink of how TNW operates and how we present our stories to you. In a series of articles, we’ll be going into detail about different sections of the new site. First up – the homepage, and in particular, the ‘cover’. There has been much talk about ‘the death of the homepage’ in recent years. As increasing amounts of traffic to articles comes directly from social channels, the argument goes that homepages just aren’t that important any more. We disagree. Our homepage is consistently one of the most popular pages on the site, with visitors lingering for an average of 20 seconds as they browse the stories on offer. At present, our homepage is entirely automated, which means the latest story gets prime position. That doesn’t always make sense – readers want guidance as well as an idea of what’s brand new. So, in the new design we’re embracing curation with style. The new ‘cover’ section at the top of the homepage is a flexible ‘first destination’ for visitors to the site that allows us to show you what we think is most important right now. We can show between one and five stories in the cover area. So if Facebook’s bought WhatsApp (wait, they did?!) and everyone’s talking about it, we can make that the single biggest focus of the homepage. Our developers have created a really nice interface that allows me or another editor to change the homepage around at will. This means that when a big story breaks, we can instantly give it the presence it deserves. It’s fun to use, too. The icons wiggle like iOS homepage icons as we move things around. Check out this video to see how it works. So that’s the cover – your first glance at what’s hot on The Next Web at any given moment. Look out for more articles exploring other parts of the new design over the next few days. 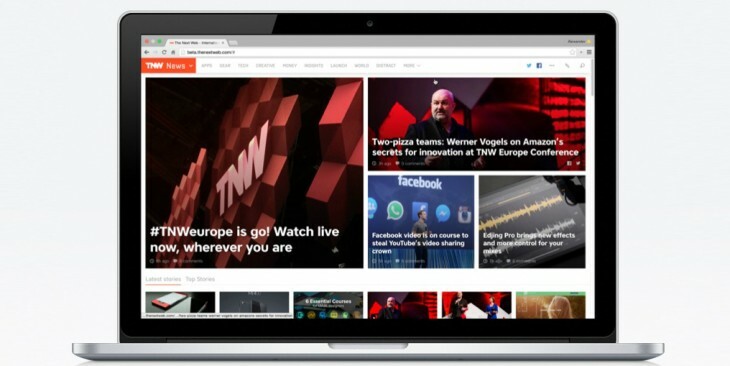 You can try the new site in beta at beta.thenextweb.com. Please email any feedback to beta@thenextweb.com.